The budget of my beloved and crazy State of California is dependent on capital gains taxes. They kick in when the stock market is booming, when IPOs fly off the shelf, and when dubious stocks quintuple in short periods. Capital gains taxes gush into the state’s coffers when flipping homes is so hot that folks listen to radio shows to learn how to get rich quick that way and when founders and employees of startup companies pocket millions or even billions in imagined or real gains as their cash-burning outfits take on multi-billion-dollar valuations or are acquired by Google, Facebook, or Yahoo for mind-boggling amounts. The bigger the boom, the more magnificent California’s capital gains tax revenues. So now, California is projecting a “surplus” for years to come, and legislators are fighting over how to spend it. But the $2-trillion economy, the eighth largest in the world ahead of Italy and Russia, isn’t always blessed with asset bubbles. Twice in its boom-and-bust history, California has been incapable of paying its bills, most recently in 2008, when it escaped default only by mailing fancy-looking IOUs to suppliers, instead of paying them with real money. That these “unfunded liabilities” can bite viciously in all directions has been made clear by the municipal bankruptcies of Detroit, MI, Stockton, San Bernardino, Vallejo (all three in California), Jefferson County, AL, and others. The average for all states is $6,492 per taxpayer. These sums are particularly grisly in light of the US median household income of $53,900. This median household has more than one taxpayer. So for example, in Connecticut, the burden on a household with two incomes, and thus two taxpayers, is $96,200. States like California are required to have a balanced budget. So every year, they sort of balance their budgets, and sometimes they even have a “surplus.” Yet, states have a “wall of debt” – as California Gov. Jerry Brown called it – that just keeps growing despite the requirement for “balanced” budgets. And this “wall of debt” conveniently doesn’t even include the unfunded liabilities that are so huge that no one knows how to deal with them. So they’re swept under the rug until something blows up. “Gimmicks,” “accounting tricks,” and “shenanigans”: that’s what State Data Lab calls the methods elected officials use to “balance” their budgets without including the funds for promised pensions or retiree healthcare benefits (you can check on your own state here). Some folks are trying to assuage our concerns by claiming that unfunded liabilities don’t matter because all these promises that have been made over the years to buy votes aren’t all coming due today, that not everyone is going to retire right now, and that not all retirees are going to get deadly sick this very minute. But then, not all bonds have to be redeemed all at once today either. These are liabilities that have to be dealt with in the future, one way or the other, even if they’re artfully kept from showing up in the already high “wall of debt.” Something taxpayers can look forward to fondly. Cali state government is run amok by the Democrats on the both houses and “forever” Governor Brown. They manage to “balance” the budget by increasing variety of taxes as well as windfalls from SillyCon valley IPOs and stock options. 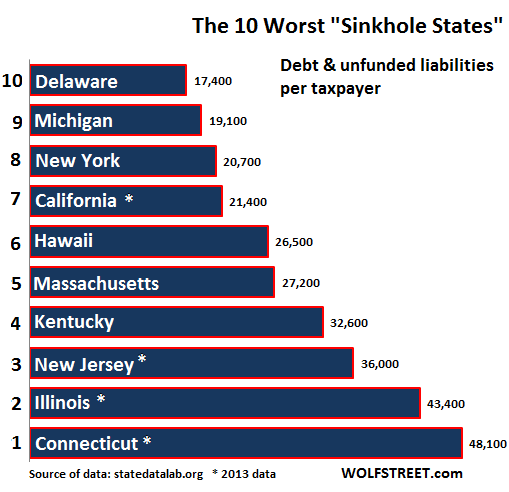 Wolf, you are right that Connecticut is a sinkhole for taxes, but let’s be clear about the reason. Connecticut is a small state and a startling amount of it is tax exempt for one reason or another. Some belongs to the federal or state governments, some to a plethora of non-profit organizations many of which are immensely politically powerful, some belongs to our three Indian tribes, and believe it or not, about 15% of the surface area is under water. This causes the tax burden to be very regressive. All of these economic problems may end up causing profound political shifts.I am an ex-New Yorker now living in southern Fla. I read an article a few months back speaking of the political shifts in Washington caused by demographic changes in the last 50 or 60 years.These political changes are the result of the migration of large numbers of Americans From northern Blue States to Southern Red States! The Red States have much smaller welfare & entitlement obligations which leads to less taxes & charges dumped on productive people.When the bottom falls out of the national economy,which it will,the Red States will see an even larger influx of industrious tax payers.The States they leave will be hollowed out shells with huge debts & a minimum of funds! Whatever wealth still remains in the old U.S. of A will be in the “sunny South” or conservative areas out west. I cannot see a Red State like Florida or Texas pushing it’s citizens to come across financially in order to bail out New York or California.Washington may push for more taxes but the Red States will resist to protect themselves. This may be a turning point in returning power to the states! Don’t forget tho… A debt that can be rolled-over is really an asset. True… It’s an asset for one side, but a liability for the other. If the borrower can’t live up to the promises made, the “asset” that the other side owns becomes worthless. When creditors or potential creditors feel that the borrower’s promises might not be kept, that borrower’s debt can’t be rolled over because no one wants to buy the new debt only to get ripped off. Hence a debt crisis. See Greece. Thought debt is considered as liability? Anyway debt is either paid off or defaulted. It’s very hard to wrap one’s mind around the utter devastation that’s been inflicted on Kern County. It does NOT surprise me that they’re building high speed rail through it. 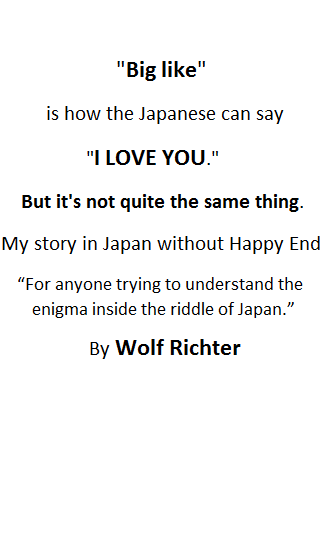 It may be the perfect non-sequitur. Of course no politician is going to risk (further) unpopularity by trying to deal with the nightmare of unfunded liabilities, because they figure they’ll be moved on or hopefully up well before the bill comes due, meaning it is strictly an S.E.P. I mean seriously, has anyone ever run on, much less won on, a pension reform platform? In this almost visceral recoil from taking any necessary pain, the elected are at least proving themselves to be completely representative of their constituents. For once.